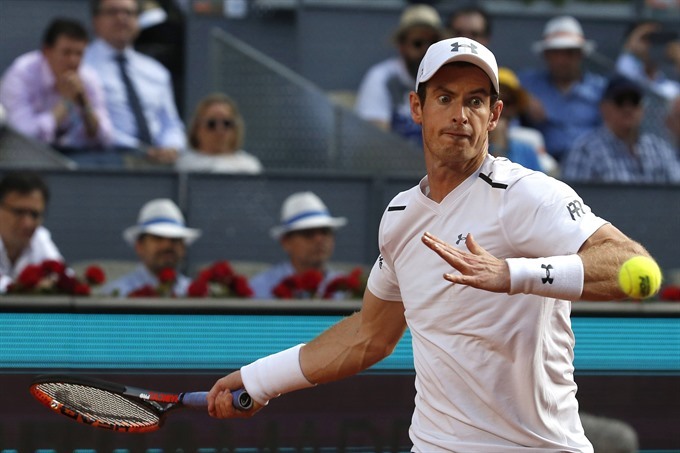 MADRID — World number one Andy Murray enjoyed a comfortable start to his quest for a third Madrid Masters title with a 6-4, 6-3 win over Romania’s Marius Copil on Tuesday. Murray has struggled for form and fitness since soaring to the top of the world rankings at the end of last year. However, the Scot had far too much guile for the big-serving world number 104 as he didn’t face a single break point in sealing victory in just under 90 minutes on court. "I still think there’s a ways to go. I don’t think I’m playing perfectly just now," said Murray. "I had no break points against me. That was something that obviously I’d struggled with, especially the last couple of tournaments. "It’s a good sign for me that my serve is getting better. Hopefully that continues that way. "When I serve well, the rest of my game tends to follow. It’s an important part of the game for me." Murray will face either Frenchman Pierre-Hugues Herbert or Croatia’s Borna Coric in the last 16 on Thursday. The Wimbledon champion passed up two chances to break the Copil serve in the second game of the match. But Murray eventually made his move and let out a cry of joy with a brilliant cross-court half-volley to break Copil’s resistance and take the first set 6-4. One break in the sixth game was also enough for Murray to take the second set as he easily served out for the match. Murray’s conqueror in Barcelona last month and potential quarter-final opponent Dominic Thiem eased past American Jared Donaldson 6-3, 6-4. Ninth seed David Goffin became the first man into the third round with a routine 7-6 (7/3), 6-0 win over Germany’s Florian Mayer. Nicolas Almagro will face second seed Novak Djokovic as he begins life without long-term coach Marian Vajda on Wednesday after beating fellow Spaniard Tommy Robredo 6-3, 3-6, 6-1. Rafael Nadal is also in action on Wednesday against Italy’s Fabio Fognini. In the women’s Madrid Open, defending champion Simona Halep came from 5-2 down in the final set to beat Roberta Vinci 6-3, 2-6, 7-6 (7/2) to reach the third round. "I was close to losing the match, but I stayed strong, stayed focused and I didn’t give up," said Halep. "That makes this match much bigger for me. It means a lot." Halep very nearly became the latest seed to fall in a decimated bottom half of the draw after early exits for Karolina Pliskova, Garbine Muguruza and Johanna Konta. "I don’t know who lost and who is still in the tournament," added Halep. "I try to focus on myself a lot. As you saw today, I could have lost the match, so it doesn’t matter who is winning, who is losing. Every match is tough." Halep next faces Australian 16th seed Samantha Stosur.